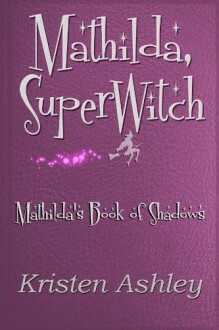 On Hallowe’en night, Mathilda Honeycutt finds out she’s a SuperWitch. Not the modern, hippy kind… the real, wand-wielding, pixie dust kind. After a life devoted to retail and coffee drinks, Mathilda is thrown into the secret world of witches, warlocks, werewolves, vampires, faeries, headless horsemen, you name it, it exists… even whirling dervishes!As Mathilda discovers her magic, she also discovers she’s prophesied to save the world. Problem is, she’d rather spend her time on online auctions, bidding on cut-rate but fabulous designer shoes. Now, she’s got to save the world, run her coffee house, battle against her co-worker in “The War of the Wooden Spoons” and figure out what’s going on with the silent, watchful (but yummy) Sebastian Wilding, a member of a centuries old Secret Society who has vowed to keep her safe and brainy, sweet (and hot) Dr. Aidan Seymour, a maverick member of The Royal Institute of Psychical Research. Making matters worse, her nemesis is a powerful witch who doesn’t mind fighting dirty. Will Mathilda be able to save the world while still being perfectly accessorized? And how is she going to pick between Luscious Sebastian and Dreamy Aidan? And will she be able to talk The Witches Council into updating their uniform? And, lastly, will she ever get the hang of riding around on a broom? I can officially say that I've read everything Kristen Ashley has written thus far now. So, yay.